Sometimes innovation is about having a sense of the big idea, then paving the way one step at a time. Creativity and exploration certainly is part of the learning process. As an engaged digital literacy educator, I invite my students into powerful opportunities to engage in conversation with other learners across the country through the Youth Voices Community. Through this professional learning space, several dedicated teachers, including National Writing Project teachers, engage students in conversation through written discussion and video conferences, as well as support with guides for writing and learning with shared curriculum. In the fall of 2016, Youth Voices teachers embraced an opportunity to rethink curriculum for this learning community with the help of the Sandboxes for Learning grant and the LRNG platform. Four teams of teachers across the country embarked on a journey to further reflect on Connected Learning opportunities for students through use of playlists and shared learning on Youth Voices as a way to invite learners to get lost in their learning. Through conversation and reflection about the Youth Voices Community and LRNG playlist learning space, our Red Cedar Writing Project at Michigan State UniversityYouth Voices and LRNG team has begun to think about ways of reimagining curriculum design and student engagement. Spaces for learning — even digital ones — require awareness of the objectives for learning, goals for community, and the steps to achieve these goals. We knew we were engaging students in Connected Learning Principles through connections via Youth Voices and that curriculum work would be designed with some game design framework. As such, we started with exploring the LRNG platform. We read playlists through the lens of a genre study in which we identified features of a playlist and their function. Within this system, playlists offer opportunities for a student to explore content in the form of XPs. I often thought about these as a track to a song or a step in an a sequence of learning. Through several XPs (digital XPs for curriculum content happening digitally and local XPs for curriculum content in specific cities) learners build competency in skills or ideas explored in the playlist. After completing several learning XPs in a playlist, learners can earn a badge to demonstrate their competency in a specific area. In this way, design elements and sequencing for a teacher to design curriculum is part of content creation. 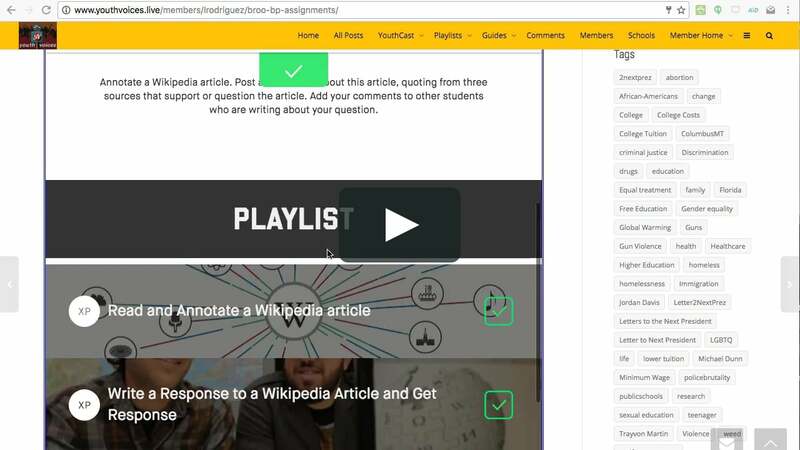 Also, considerations of how a learner will engage in the content was another element of reflection, as opportunity for one-on-one clarification or mentoring that might take place in a classroom, would not be available through a playlist depending upon how use of a playlist is implemented. Unlike a “traditional” classroom framed for students to earn a grade in exchange for their display of competency, learners would be motivated by achievement visual represented by a digital image or badge representative of their work. This further led to exploration of game theory, at a cursory level. With the help of Paul Allison, our project leader, and Lucas Blair of Little Bird Games, we started to scratch the surface of understanding the goal of a playlist or game to be changing the person experiencing the game. Similarly, as educators, we want to impact the learning or change the learner through a positive growth in skills or exposure to new content knowledge. And we want to empower a learner to make and create. Inviting a learner into this learning space without teacher guidance and with intrinsic motivation to be involved in this learning is a focus of this project. As a team, we continually reflected on the genre of the playlist as a choice or game experience. Through discussion, we revisited ways to invite students into learning with clear and inviting directions. We thought through context including a consideration of who would be involved in the playlist. In December of 2016, a group from cross sites, held a persona workshop to refine our thinking about diverse learners who may engage in playlists for learning. This in turn, was shared with each Sandbox for Learning site as we continued to frame and reframe, phrase and rephrase our opportunities to learn. And we reminded ourselves this work was not about merely flipping content for learning, but rather to create a learning space unique to each learner as a part of the Youth Voices and LRNG communities. Through conversation on Teachers Teaching Teachers and in numerous group reviews, we engaged in critical discourse to look at phrasing of invitations, engaging activities, and appropriate learning sequencing. Our RCWP team of seven teachers, naturally developed different areas for curriculum directly tied to the literacy learning. Areas that emerged included reading and researching responses, writing and argument, visual communication, activism, writing across content areas, and writing to better understand ourselves. Workshop discussion with our RCWP team, along with our cross site conversations, allowed the group to further hone opportunities within the LRNG and Youth Voices learning space. We discussed opportunity to share these learning opportunities in classrooms, as well as in extension spaces through programming outside of the school day. The LRNG space also allows for a learner to explore their interests more independently. We hope learners will naturally want to get lost in their learning spaces and truly engage in content that supports learning and refining skills through writing, discussing, and creating. We have paved one road with the playlist creation and we now look forward to the next path being created with student involvement or playtesting of playlists this spring.